First, the roof of a stand-alone, meaning that is supported by four main pillars, or simply two poles by using a cantilever system. Column or pillar can be concrete, wood, steel, or a combination of these materials. These models are usually separate from the house. Second, the structure sticking mostly on the front or side of the house. The advantage, the material is more efficient, because, means just simply add two fulcrum as pole. Two other pivot point sticking in the walls of houses in a way dipantek or rivet, or join in the roof structure of the house. To blend aesthetically with the house, the roof must use materials that conform with the construction of the house, such as tile and wood. Third, hanging model and a cantilever structure with iron or steel sling. With this pattern, there is a carport space that is wide enough, because it is not obstructed by two columns or pillars. Therefore, two columns leverage that is at the edge of the page. Two ends of the roof hung to a wall or pole. To be strong and durable, the type of roof hanging selected from material that is lightweight and flat roofs, can be tilted, but not curved. 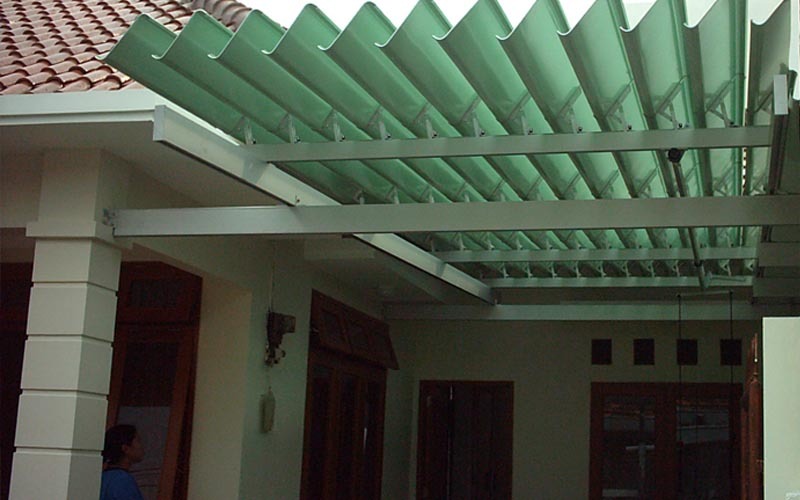 Carport roof-shaped permanent, meaning full closed, and there is also a retractable roof closed. Roof fully closed, can use this type of tile or concrete. Tile can create a cool atmosphere because it can reduce heat. Can be made of ceramic tile, clay, glass, concrete, asphalt and metal.